Now in its third year, Oakland’s Umoja Festival is well on its way to becoming an Oakland cultural institution. Originally started in 2013 by community organizers Effie Tesfahun and Stephani McGrath, Tesfahun’s sister Tsedi, DJ/photographer Juan Gomez, and fashion designer/futbol aficionado Baba Afolafi, Umoja—which means “Unity” in Kiswahili—was conceived of as a music festival and soccer tournament celebrating Pan-Africanism and Afro-Diasporic culture. On Saturday, as record temperatures soared unto the low 90s, West Oakland’s Lowell Park even felt a little bit like the African savannah, sending folks scurrying for shade and hydration. A row of vending tents ringed the park’s perimeter, offering everything from fresh-squeezed ginger/tamarind juice and Cameroonian ndole to colorful fabrics from Mali and chiropractic massages. Two soccer fields had been chalked, one for young people (courtesy of My Yute), and another for an adult tournament hosted by Afolafi’s SURU brand. 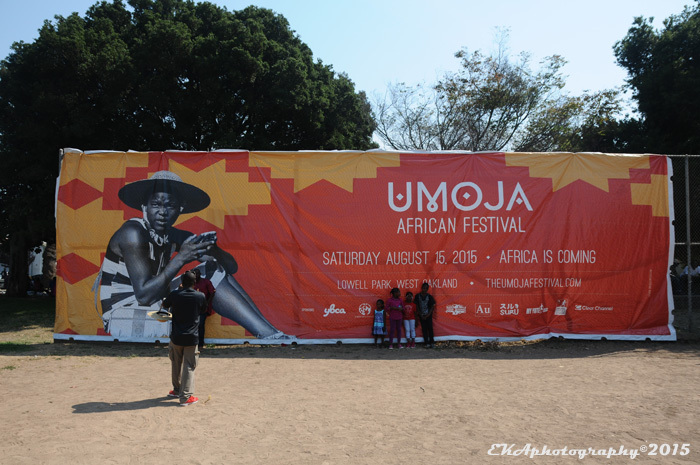 There were also two stages for musical performances, as well as a large “Umoja” banner. The musical acts were a highlight. Early on, the conscious hip-hop duo of Kev Omoage Akhidenor and Ryan Nicole, collectively known as Nu Dekades, rocked a set which exemplified the Oakland meets Africa theme. Nicole is simply fierce on the mic, and should be regarded as one of The Town’s hottest emcees regardless of gender. Akhidenor matched her for intensity and lyrical content, as they unleashed a blistering demonstration of revolutionary, social justice-oriented lyrics over boom-bapping beats. Akhidenor took the time to explain the “pata pata” chant in Fela Kuti’s classic “Upside Down” before he and Nicole launched into an updated version, which he dedicated to all his “Najas” (Nigerians). A mid-afternoon set by Piwai and the Zimbabwe Mystics offered world-class world beat which incorporated traditional East African rhythms along with Afrobeat influences, as Piwai alternated between singing lead vocals and playing the hypnotizing harmonics of the mbira. And a closing set, by Kingston, Jamaica-born Jah’Mila, kept the vibes irie with an exquisite cover of Judy Mowatt’s reggae classic, “Black Woman.” In-between, emcee/hostess Jennifer Johns supplied fiery energy and kept the crowd amped, while a succession of DJs including Emancipacion, Nina Sol, Mina, Mpenzi, Aebl Dee, Xander and K-la-Vee played music in line with the Diasporan theme. SambaFunk also made an appearance, dancing in a line around the vendor tents, pausing at the second stage, then making their way back to the main stage. This year’s crowd was the festival’s biggest yet – a turnout which in and of itself made a strong statement in the midst of a rapidly-gentrifying Oakland. Many folks rocked dashikis or African prints, as Ethiopians, Kenyans, Nigerians, Zimbabweans, Sudanese, Senegalese, and Ugandans freely mingled with Oakland’s African Americans as well as people of other hues who share a deep appreciation for African culture, music, and food. It was especially nice to see Lowell Park, an underutilized West Oakland gem, be activated for such a vibrant event, even if the space wasn’t completely filled. But then, the location is so expansive, it would likely require at least two or three thousand people to maximize the capacity. That gives Umoja something to aim for in years to come. Categories: Event review | Tags: Afrocentric Oakland, Bushmama, Effie Tesfahun, Jah'Mila, Jennifer Johns, Lowell Park, Mi Yute, Nu Dekades, Piwai and the Zimbabwe Mystics, SambaFunk, soccer tournament, SURU, Umoja Festival 2015, West Oakland | Permalink.